Eric Fell did a short interview with CBC Radio’s Early Edition last week to talk about The Critical Hit Show. The fantastic folks at Strategies Games were kind enough to allow them to hide out in a corner while the interview was conducted. 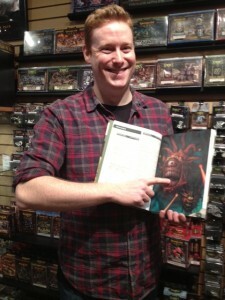 Here’s a link to the chat, as well as a picture of Eric getting his finger chomped by a Beholder.